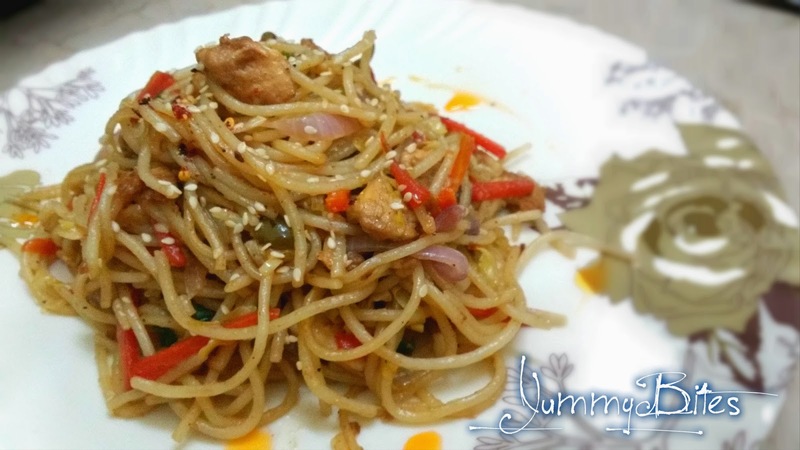 Chinese style noodles with as many as 25+ variations are very common in the Pakistani restaurant menu card, but originally very few Chinese restaurant are serving authentic Chinese food. Many local restaurant often misunderstood those noodles dishes with the name Chow Mein, where as, chow mein is far more different what is served in restaurants and those very common soft, moist, stir fired noodles with mix veggies and you get on your table is actually Lo mein. Secondly, Many of you who was already familiar with words chow mein and low mien still frequently assume that the main difference between lo mein and chow mein is the type of noodles that are used. It makes sense - after all, chow mein noodles are crisp while lo mein noodles are soft, right? Actually, the main distinction between these two popular dishes lies in how the noodles are prepared. Mein or Mian is simply the Chinese word for "noodles". Lo Mein means "tossed noodles," while Chow Mein or Chao Mian means "fried noodles." 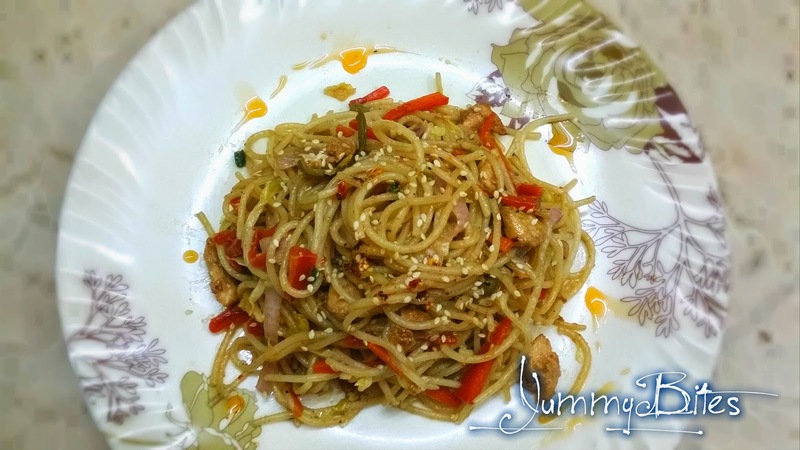 I have tried Chinese chicken noodles many times at different places and what I have observed that in Pakistan every cook or housewife have it's own version of Chinese noodles, so do I. I like to think of this dish as a white canvas. You have your noodles and sauce as a base, and virtually any vegetables you like as your paint palette. You just have to put ingredients you like as you put colours on blank canvas. In any case, you can feel free to use onions, scallions, bean sprouts, bamboo shoots, carrots, peppers, mushrooms, napa cabbage, any leafy greens, peas, or even thinly sliced celery. moreover, chicken, prawns, shrimps, beef, lamb as for meat variation The beauty is that you can adapt this noodle dish to you and your family’s tastes and better yet, any of the local seasonal vegetables you have available. One more thing I used to call secret ingredient for this is the Chinese Chili Oil, its not only the secret of the recipe but for the Chinese cuisine also. Chinese use alot of chili oil, sesame oil, chili paste, chili bean paste, Sichuan chilies etc. these are easily available in super markets but I used my own homemade garlic version of chili oil. Although lo mein is traditionally made with Chinese egg noodles, If Chinese egg noodles aren't available, Italian pastas such as fettucini or linguini or spaghetti make a handy substitute. Mix chicken, sauce soy sauce, black pepper and let it marinate for 15 minutes, (mean while you can boil noodles or prepare vegetables) after 15 minutes add corn floor and egg white. Heat oil in wok and fry chicken in two batches till chicken pieces are slightly golden. Drain and set aside cooked chicken. Remove the excess oil but leave 2 tbsp in the wok for stir frying vegetables, different vegetables have different cooking times, so these should be added in their delicacy sequence. Firstly, add carrots and stir fry for 3 minutes, add capsicum and mushroom at the same time, stir fry for 2 minutes, add cabbage, pinch of salt, vinegar and stir fry for more 2 minutes. Remove the veggies. In the same wok, add 1 tbsp oil from the previously removed oil, sauté garlic and onions, put the stir fried veggies back to the wok and mix well. add precooked chicken, parboiled noodles, soy sauce, sesame oil, chili oil salt, black pepper, chili flakes, sesame seed, green onion and stir fry all thing together for maximum 5 minutes. Garnish with sesame seeds and drops of chili oil and serve hot.